Via Bella Sugar – Among Karl Lagerfeld’s interests, fashion being key, books seem to be inching towards the top. Lagerfeld, along with publisher Steidl, will be introducing a new perfume like based and inspired by the smell of books. The perfume called Paper Passion will be sold in hollowed out hardcover books. Via Martha Stewart – First comes marriage (check) then comes the baby carriage (unchecked). When it is time to check the mommy box, I’ll be sure to implement Martha Stewart’s book-themed baby shower. Via Chicago Sun-Times – A beautiful entry, Does Anyone Want to be “Well-Read”, written by Roger Ebert about the difference between books read and unread, and just how limitless the universe of print really is. In a way, this makes keeping track of all the books I read some of futile. The unread list is infinite, while my read list is dismally low in the ranks in comparison. Via SF Gate – In the same vein, SF Gate writer Stephen K. Tollefson, write a wonderful piece about how the light we read with effects how we read. I prefer to read in a fully lit room, with the dim noise of TV in the background. I can’t read in pure silence, its too distracting. Piles of books were burned in the Colorado City, Az, the polygamous community that borders Utah. These books were meant for a new library, and instead found themselves turned to ash. Three Cups of Fraud – Author Greg Mortensen is facing accusations of making up most of his highly acclaimed memoir, Three Cups of Tea. Watch the 60 minute segment with the author as he tries to defend himself against the allegations. What could be the missing element of my life…the happiest and most wonderful book I ever stumbled upon… Bear With Me by John Pollack, the 1995 O. Henry Pun-off World Championship Winner. My best friend since high school was one of my bridesmaids at my wedding this past weekend. She has always been a great support system for me, as well as my primary source for new and interesting authors to read. She is the one who introduced me to Neil Gaiman, and I felt it was only fitting that she read Neil Gaiman’s Wedding Poem during the ceremony. Here is a print of the poem that Mr. Gaiman wrote on the fly in the guest book of his friend’s wedding. Its National Library Week! Everybody celebrate by going to your local library and checking out the maximum number of items humanely possible to show your support. This is a fantastic article on CNN about how libraries and librarians are the most awesome elements of education, information and pop culture ever. Read it, believe it, and acccept it. Librarians are cool. Every house you live in must be outfitted with a walk in closet. Just in case. No matter what, you’re always the only one at the office at 9am on the dot. Then you annoy everyone all day with all your clever puns. You’re the guy who finds a way to ruin every party. What I consider to be a “Well, Duh” op-ed article via NPR’s Monkey See blog, in which writer Linda Holmes walks into a library and finds out that its a really cool place to be. What did Linda ever imagine a library to be if she’s so amused and amazed at what libraries offer today? A wonderful and insightful segment about the discussion of e-books and their effect on libraries by NPR in the wake of the controversial HarperCollins 26 check-out limit on e-books for libraries. Agree or disagree? Tom Keane of The Boston Globe discusses how the book is dead and bookstores are a dying enterprise in his op-ed The Last Chapter. Send letters in envelopes that are no larger than the width and length of your thumb! (via Chronicle Books, release date April 27th, 2011) The kit is based on the World’s Smallest Postal Service project by Lea Redmond, who offers a tiny transcription service through her roaming “post offices” in the Bay Area. You can pre-order now @ the Chronicle Books site and get 30% off your order. This masterpiece, a copy of UVL, is created by a University of Virginia law student, built entirely out of law firm rejection letters. Penguin classic covers as embroidered art. These are beautiful pieces created by artist Jillian Tamaki. “Press Here” by Hervé Tullet’s is an interactive (and unplugged) creation letting kids enjoy books for what they really are. 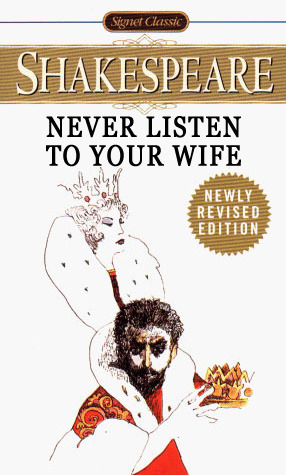 Looking for books for the men in your life? Check out this blog, Guys Read as a primary resource for books and boys. A wonderful and thoughtful collection of books compiled by NPR to help Americans learn more about Japan, its history and culture. The book review and the author commentaries from Hell…at Big Al’s Books and Pals. This post has pretty much gone viral in a short amount of time, and I feel no shame in posting it here. The comments are deliciously vitriolic via the author in question, and am I ever so glad to see Big Al stand by his review. BethFishReads is hosting an international giveaway for “One of Our Thursdays is Missing” until April 10th. OpenLibrary.org runs like a wikipedia for books. You can access over 80k titles in the classics genre. During the “library visit” patrons can borrow titles and download them directly to their iPads, laptops, etc. When you look up a title, you can either borrow the e-book online, find it at a local library via links to Worldcat.org, or buy it online via links to: Alibris, Amazon, AbeBooks, Biblio, & Powells. Signing up is free. Interesting article by Mark Evans on why Barnes & Nobel is succeeding while Border’s is suffering. A Tree Grows in Book Form. Plantable Paper is coming out 2 new books that lets you, upon finishing the books, plant the pages in soil, water them and watch as they turn into patch of herbs or flowers! The Lisa Simpson Bookclub…now on Tumblr! Everyone’s favorite precocious, smarty-pants sibling on the Simpson’s now has a blog dedicated to posting pictures of Lisa reading, talking to authors, or any other bookishness. Readers are encouraged to submit photos of the pointy-haired bookworm. Everything But Urban interview with author Christopher Moore (Bloodsucking Fiends, Fool, etc). The hilarious author discusses his favorite authors and his new graphic novel The Griff. The Guardian has yet another fabulous list of things book-related. This time its the greatest library scenes in movies. A trove of Thomas Jefferson’s books (28 titles in 74 volumes) were discovered at the Washington University in St. Louis. Jefferson, as you may know, sold his entire library of books, some 6,700 volumes to the nation after a fire burnt the original Library of Congress. 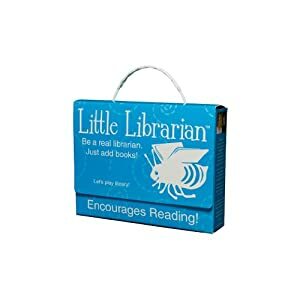 Raise your own little librarian with the Little Librarian Kit. This adorable little kit includes: Book pockets, check out cards, library cards and bookmarks just like the ones you’d find in any local library.